Pablo is a UIAGM High Mountain Guide and Barranco Guide. 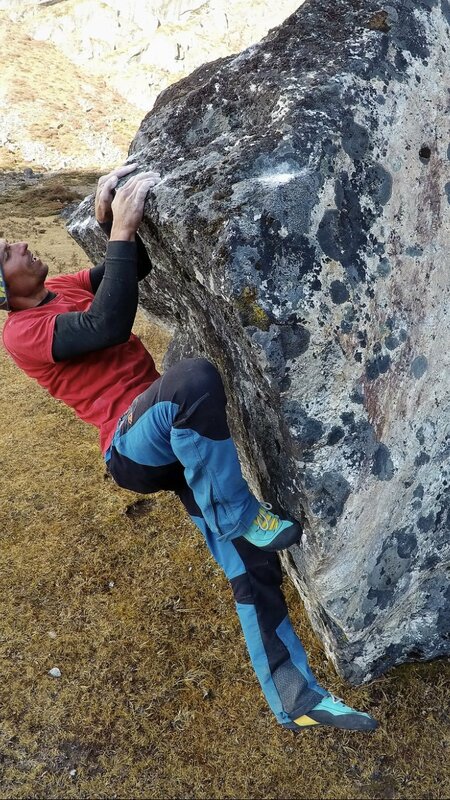 The last three years he has been part of the Spanish Mountaineering Team where he has done a lot of important activities and in 2018 he obtained two Golden Piolet nominations for the openings in the Rolwaling Valley (Nepal) that same year. Rock climbing has always fascinated him and thus has reached a level of 8c tested and 8a sight, with more than 200 routes of eighth grade chained, combining wall climbing with sports. In this discipline some of its achievements are the release of "Revelación" 500m, 7b + on the west face of Naranjo de Bulnes, the first national repetition in free and seen the route "Yellow Diedro", ED +, 650 m, 7b in the north face of Vignemale Peak, the first repetition of "Agur eta Ohore" 300 m, 8a in the Tower of Marboré and many other renowned routes such as "The Nose" to the Captain or Rostrum and Astroman in sight also in Yosemite. In his mountaineering career he also has a wide repertoire climbing routes up to WI6 +. Thus, it has several openings in the Himalayas such as "Mukti" 500m, 6c in India or others in Nepal as "The Moon" 400m MD, V +, 65ºM. "Dannebat" 900m MD +, WI5, M4 / 5 to West Chekigo 6190m, "Tick Chha" 1200m ED, WI5, M6 + to Bamongo 6400m or "Bihana" 1500m ED +, 6c + to Langdung Peak 6357m. Some other openings in closer walls are "Shima" 550, 7b, M6, IV + and "No tomorrow" 450, 6c, M7, V, 90º in Peña Telera, "7 lives" ED +, WI5 +, M7, 300m in the face north of El Olibón Peak or "Freestyle" WI6, M9, 200m and "Superbioeco" WI5 +, M6 +, 150m in Ecrins, among many others.